A new venue for people in the Crawley and East Grinstead area. 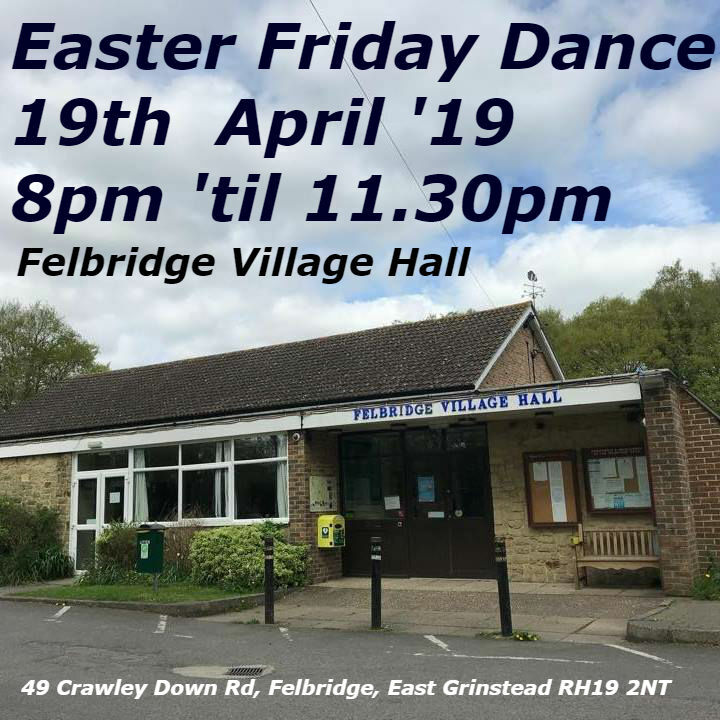 A fabulous night of dancing on Good Friday. Bring your own wine, beer, etc. We'll provide soft drinks, tea, coffee, crisps and chocolates. Just £8 in advance or £10 on the door. with "A Taste of Italy"
A fabulous night of dancing with a "Taste of Italia". Ravioli, Tirimisu, a glass of Italian wine, beer or a coke, etc. Bring your own wine, beer, etc if you'd like more. Just £10 in advance or £12 on the door. No more to pay. We had fabulous feedback from our first two visits to this brand new venue. People loved the floor and the venue. As with all new endeavours, we've had a few teething issues which mean the event will be even better. Here's details for the improvements..
- Direction Signs. The venue is only five minutes from the A24 at Washington. However, there's a few turnings which are badly signposted and some people got lost. So we're putting out directions signs saying "JIVE" to help people find the venue from the A24. Sound system - we are now using the installed sound system which is designed for the acoustics of the hall. This has reduced the echo and made the sound much better. Thakeham Village Hall is just five minutes West of the A24 at Washington or Ashington. Very easy travelling distance from Worthing, Steyning, Horsham, Shoreham, Petworth, Chichester, Littlehampton, Bognor, Haywards Heath, Burgess Hill, Brighton, etc, etc. .. the postcode for the postal address took us to the a nursery school a street away! "Well, I have a dream too, but it’s about music and dancing and making people happy. It’s the kind of dream that gets better the more people you share it with. And I found a whole group of friends who have the same dream, and that makes us sort of like a family."